This entry was posted in Uncategorized and tagged educational technology, Marketing, technology by Natalie Sapkarov Harvey. Bookmark the permalink. Well done! Both of these are beautiful, eye-catching and visually stunning. Your Summer Reading program is so colorful and cheerful. I used to be a K-9 librarian and know my students and parents would have loved something like this. Thanks for taking the time to share your process and product, as well as the software and platforms you used. I am definitely going to try out both for my newsletters this coming year. In answer to your question on design, I do definitely think about design all the time. I believe clunky or unappealing resources definitely hinder user engagement. 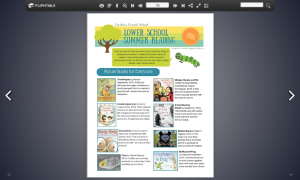 This is my first year at my current school (my 19th in Independent Schools) and for our summer reading I created a LibGuide that lists the various required reading and included resources for students to select their own books once they meet their required books, including an All-School Read. My students are accustomed to using LibGuides and our All-School Read involves our alums, parents, Board members and others in our community so I thought using LibGuides would give them an idea of how we are using technology to make information accessible. Thank you for sharing! I love how you were able to integrate required reading and reading for fun all in one place. I also like the clean look of LibGuides. Might have to keep it in mind as I try to make our library’s website more user-friendly! Thanks for this share! Your two samples are amazing! Curious, what was learning curve for the layout/formatting/upload was like. 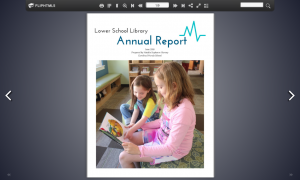 Was there significantly more time required for you to get this annual report up and running relative to what you had previously done in Pages? PS-Love that your publications seem to look and read fine on both laptop and iPad (Better on the iPad, actually, which is good for me as we are 1:1 iPad…). Glad to hear that they look good on different devices!